When he proposed I couldn’t say I wasn’t expecting it. I was not expecting it that second, but I knew it was coming. The summer before our eight year anniversary, we were heading to Quebec City for the weekend to meet with his parents who were staying there for the week. Obviously, we forgot to put gas in the car so we ended up at this random gas station not too far from our house. That’s when I realized we were next to an “antique meets garbage” market. I wanted to go. So there it was. The ring was sitting in the counter. I knew it and he knew it. Those lovebirds above, Alyssa + Mat, were the first (of what are sure to be many) couple to tie the knot on these totally impressive grounds. They wanted to keep things simple, pulling their inspiration from artistic painting details + vintage finds. They smartly decided against certain traditions that didn’t feel like they’d be a fit and created their own rules by incorporating the things that had the most meaning to them. Brandon and I had our photographers picked out before we even got engaged. 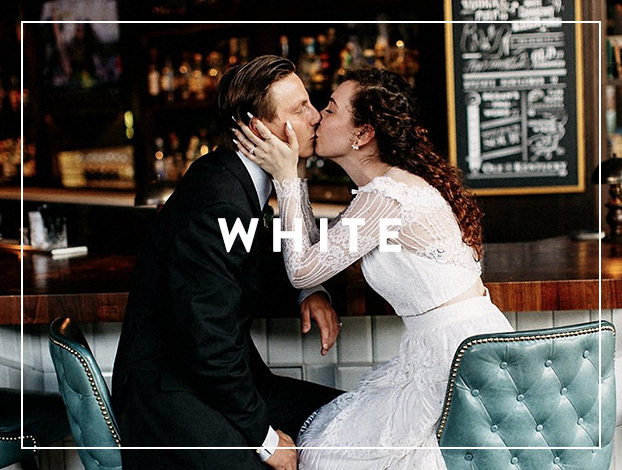 After meeting Tish through some family friends of Brandon’s, we immediately knew we wanted her to capture the special moments and stories that will begin our marriage together. I remember leaving and Tish saying, “Tell me when it happens!” So, after it happened, Tish was one of the first people to find out. Brandon and I had the best time on our engagement shoot with her and her husband Matt. It honestly just felt like we were hanging out with good friends. Their talent is unreal and we are SO excited to have them shoot our wedding day! After several failed attempts to find something in store or online, I decided I would go ahead and design my dress myself. The gown I would eventually wear on my wedding day was a gown that had lived in my head for months and months prior and truthfully, it wasn’t until 4 days before the wedding that I had finally tweaked the dress to how I wanted it. In hindsight, I remember being relatively calm about that while those around me thought I was nuts. (I definitely was!) I worked with the sweetest local seamstress and a dear friend of mine to create the dress I wanted – a simple, ethereal gown.